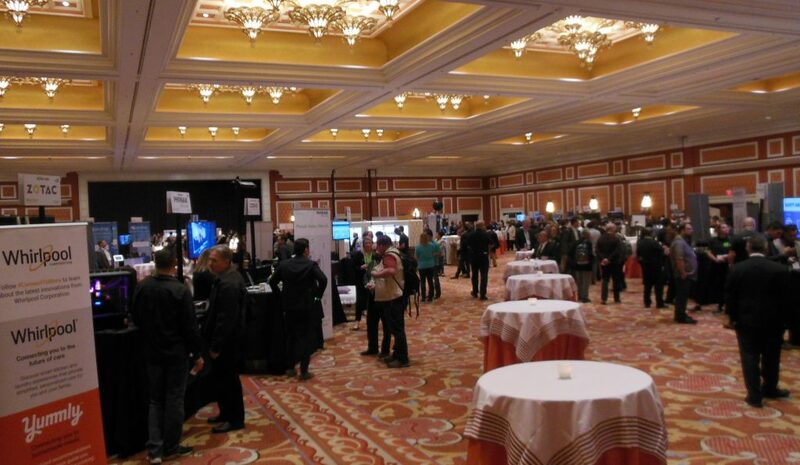 Day 1 of CES 2019 was on Tuesday, January 8th, with the Show Floors at the Las Vegas Convention Center and the Sands Expo Center opening their doors wide. That evening, in a medium sized ballroom at the Wynn, one of the best Press events of the week took place. ShowStoppers is one of the events that I look forward to the most each year, and makes a perfect ending to an always hectic Day 1. Held over 4 hours, this party features great food, an open bar, and over 120 organizer-curated companies, showing off their newest wares, blessedly free of the crowds and noise of the Show Floor. The space is large enough to give plenty of elbow room in between booths, and the event is long enough to allow you to have a meaningful conversation with each and every exhibitor, both of which are extremely appreciated. As you can probably guess, there were many amazing products displayed tonight, but like I did with Digital Experience, I’ll be choosing a handful of stand-out winners to talk about here. The following are the top 10 products that I found this evening. Let’s start with the fun stuff this time, and focus on products geared towards kids, or the kids inside us all. I’m sure you’re all familiar with the HEXBUG brand of toys, with their scurrying little crabs or pill bug shaped bots. If you like those models, their new Scorpion bot is sure to delight you. I found it terrifying, even though it was bright orange and plastic. 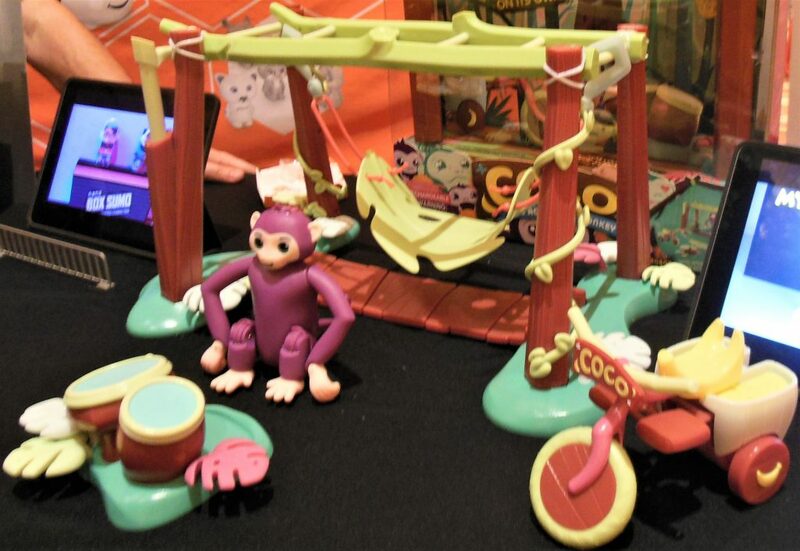 What I want to highlight today, though, is a new type of bot, a cuter, friendlier one, called Coco the Acrobatic Monkey. Coco is the sweetest little monkey, who plays drums, rides her tricycle, climbs on her jungle gym, and swings in her hammock, all while interacting with your child through touch and sound. Coco knows that you want her to play the drums, just by sitting her in front of them. She knows to start peddling her tricycle when you sit her in the seat. She’s a smart little monkey, and I can’t wait to play with her when she comes to a store near me in the Fall. Her product page isn’t online yet, but while you wait, check out all the other fun mechanical toys that HEXBUG has to offer at www.hexbug.com. Next up is SwapBots, a set of 9 collectible block creatures. In the physical world, these cool creatures are made up of 3 interchangeable blocks, a head, body, and feet. You can swap around their various parts to make mixed-up monsters of your choice. 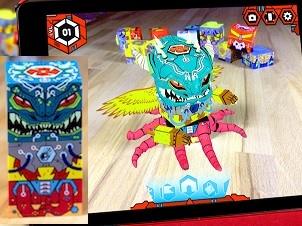 You then scan them into the AR app to unlock super fighting monsters and battle your friends. Each block section has different battle stats, like health, attack, etc., so trying to combine the pieces to make a stronger battle bot than your buddies is going to be part of the challenge of collecting and rearranging them all. Sold separately, or in packs of 3, there are 9 different starter creatures…so far. There are plans to make a lot more, including licensed ones from popular franchises, and even perhaps a blank slate model for kids to design their own. I thought it was fun just to switch all the bots’ parts around and scan them in to see what sort of creature I could create. I’m looking forward to getting a few into the office and battling it out in the app with my coworkers. This toy just finished a very successful Kickstarter campaign, and they’ll be starting to ship to their backers soon. If you want to get in on the action, you can pre-order yours for the next production batch on their Kickstarter page. Let’s stay in the toy realm, but move to a sort of hybrid between a toy and a productivity tool. The Pigzbe is an adorable connected piggy bank for kids of the digital age. The idea behind it is that kids today miss out on the simple joy of shaking a piggy bank to see how much allowance money is inside, and figuring out if they have enough for that prized toy they’ve been saving up for. 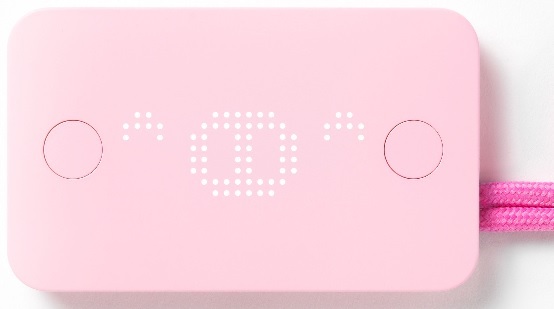 Pigzbe simulates that pleasure with a little pink rectangle with an adorable LED piggy face, connected to a gaming and money tracking app. Basically, parents purchase a certain amount of cryptocurrency specific to Pigzbe, the Wollo. They then assign amounts of Wollo that their kid can earn by doing certain tasks, like cleaning their room, walking the dog, finishing their homework before dinner, etc. A kid can see which tasks they need to complete in the app, then once they’ve done them, they’ll tell their Pigzbe device, and the app will show that they’ve earned their Wollo, after the parent has confirmed the task has been completed of course. They can save their Wollos and buy items in the app, or convert them to real currency. To check to see how many Wollos they have, all they need to do is shake the Pigzbe, just like a traditional piggy bank, and the LED display will show their saved total. This device can help kids learn all about earning, saving, and budgeting money by making it fun and relatable. Check it out at www.pigzbe.com. Veering away from fun and games for a moment, I have a device to share for when your kids need to give their screens a rest. 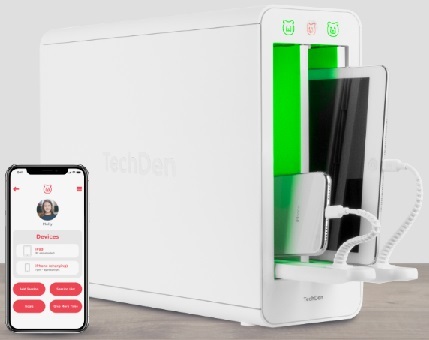 TechDen wants to encourage kids to have healthy screen time habits, and put the control of that time securely in the parents’ hands. Or rather, securely inside The Den. The Den is a slim, safe-like housing for 2 devices, which charges your phones or tablets while locking them away. You just plug your device into the charging cable inside one of the chambers, slide it in, and shut the door. You can have it unlocked and always available, or use the app to program a time frame when the device will be available to use. The icon above each door will let you know if it’s charged and ready to use, or locked away until later. The 2 chambers function independently, so if you have 2 kids with varying screen time needs, you can unlock each at different times. Even if you don’t lock the doors, you can have the app notify you when each device is removed from its Den, helping you build trust with your kids, and train them to form their own healthy screen time habits. It’s a simple device, but one I think we ALL need in this screen dependent world, both young and old. Take a peek inside The Den at www.techden.com. Having gotten you in the mood to secure your devices, let’s talk about securing your home, with 2 home monitoring products. 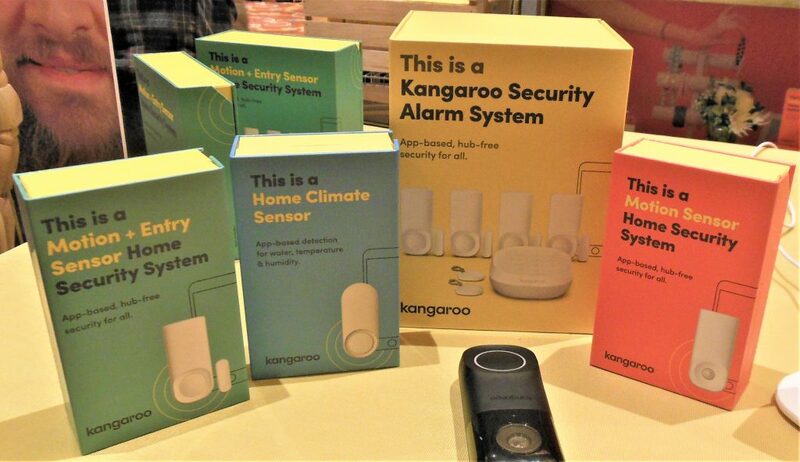 The 1st of these is Kangaroo, a suite of monitoring devices that are easy to install and require no monthly subscription to use. They have a sensor to detect motion in a room, one to detect the opening of a door or window, one to detect temperature changes in a room, and a siren to scare away intruders. Each device is installed by simply peeling away the adhesive portion and sticking it where you want it. You then download the free app and connect all of your sensors. Control and monitor them yourself through the app for free, or if you feel like you want some professional backup, you can pay for the optional monitoring plan for only $9 a month. You can even try the paid plan free for 2 weeks, and if you find you don’t need it, you can go back to just monitoring your own devices, no strings attached. Both monitoring methods allow you to automatically contact the authorities, as well as a trusted circle of friends, in case a sensor alarm goes off, and you don’t have access to your phone to notice. I love that this system gives consumers the freedom to feel safe in their homes, without feeling the need to shell out oppressive monthly subscription fees, making home security accessible to all. Start securing your own home at www.heykangaroo.com. 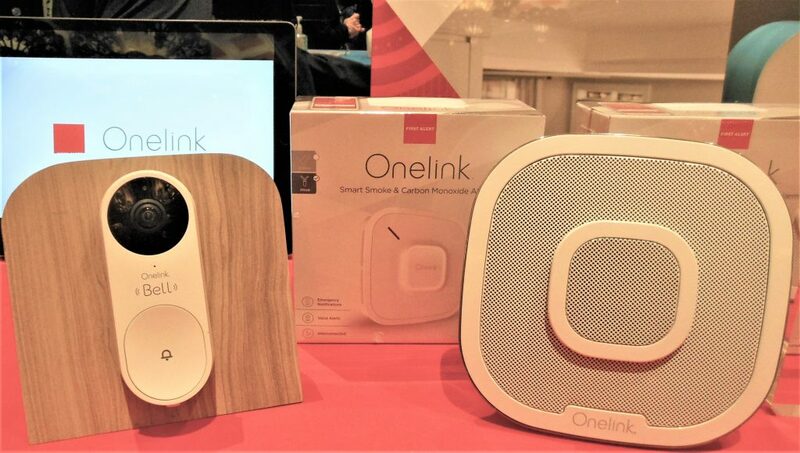 The 2nd product line I want to talk about is one you’ll no doubt know about, and that’s Onelink, from First Alert. They’ve been a trusted name is home safety for a while, though a different type of safety from the product above. First Alert has brought you smoke and carbon monoxide detectors, Wi-Fi network security, and voice assistant connectivity to control and monitor all of their devices. Now, they’ve added a new device, the Onelink Bell, a smart door bell which detects motion outside your door, has night vision, shows you an HD video stream on the connected phone app, and gives you 2-way audio to communicate through the app with whoever is on our doorstep. You can even ask Google or Alexa what’s going on at your door and have them report back. The Bell is easy to install into your existing wiring, weatherproof, and a great addition to your Onelink network, or even a perfect device with which to start your collection. Head over to www.onelink.firstalert.com to take a look for yourself, though at this time the Bell isn’t listed on their site. Connect with them for more info on a retail release date. My next 3 products are all things that can be used while on-the-go. Let’s start with mobile power, something that we all consistently use, or at least consistently wish we had on hand. I’ve written about myCharge several times in the past, and they remain one of my preferred go-to companies for quality mobile power banks. They were exhibiting a full range of power bank options at the show, but in this limited space I’ll just talk about one set, the Adventure Series. This is a sub-set of their power banks that have a ruggedness to them, a little extra protection for those of us who enjoy an outdoorsy lifestyle, but still want to remain connected to the digital world while experiencing the beauty of nature. Shock resistant, rubberized, and fitted with convenient carabiners, this line can explore the wilderness with you, hike up a mountain with you, camp under the stars with you, and when the water proof Adventure H2O releases, even go white water rafting with you. Each model has varying power storing capacities, from the 3,350 mAh Adventure Mini, up to the whopping 20,100 mAh Adventure Mega. 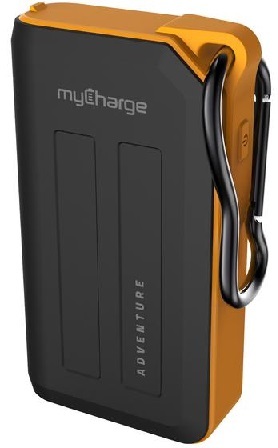 You can find the perfect on-the-go device to power up your next adventure at www.mycharge.com. Well, now that you can power your world, let’s light it up, with MPOWERD. This is another company I’ve written about before, with their Luci line of inflatable, solar charged LED lanterns. This year, Luci got an upgrade, with the Luci Connect. Like the previous versions, Luci Connect is a solar powered, inflatable, LED lantern, but along with having an improved charge life, it also now has a connected app. 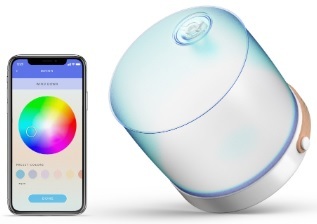 This app allows you to control the intensity of the light, play with unlimited color customization through an easy color wheel chart, schedule when Luci turns the lights on and off, set “moods” with the 32 versatile LEDs, and check the remaining battery life. Plus, with the USB connection, you can use Luci Connect as a mobile power bank for your devices, though that will lessen the hours of light it can provide. The USB connection goes the other way too, and you can recharge your Luci Connect even if the sun isn’t shining, through more traditional power sources. Luci Connect will see a wide retail release later in the month. For now, learn more about it at www.mpowerd.com/products/luci-connect, and see all of MPOWERD‘s great lighting products at www.mpowerd.com. You’ve got your portable power, your portable lighting, the only thing your mobile party needs is some portable music. Jammy Guitar has you covered, with a super-portable electric guitar, that can be disassembled into 3 parts, to easily fit into a backpack. The 17″ long neck piece has 15 frets, and though shorter than a traditional guitar neck, has enough range to play about 70% of popular rock songs, and has the added bonus of meeting airline carry-on dimensions. When assembled, Jammy Guitar can be plugged into an amp, so you can entertain your friends at a house party, or plugged into headphones, to have a private party on your own. There are different guitar tones and FX presets onboard the guitar body, and you can adjust the tension on the steel strings to utilize different playing techniques. If you connect to the companion app, there’s even more features to unlock, like changing the tuning, or playing along with a metronome or a variety of background tracks in different musical styles. Jammy Guitar automatically records everything the user plays, and will keep it stored for 48 hours, so you’ll never have to worry about forgetting that spontaneous song idea, or proving that you managed to perform a super difficult solo. This is a perfect device for musicians who like to compose on-the-go, people who simply like to practice while they travel, or good friends who want to be the life of the party without having to lug their heavy full-size guitar all over town. Jammy Guitar just finished its successful Indiegogo phase, and is currently shipping to backers. If you’d like to pre-order your own instrument before their retail-wide release, you can do that at www.playjammy.com. If you’ve enjoyed your music a little too loud over the years, standing next to huge loud speakers in crowded clubs for instance, you may need my final highlighted product of the evening. Eargo, a hearing aid company that strives to eliminate the stigma of hearing loss, has introduced the Eargo Neo, a tiny, rechargeable, app-connected hearing aid, that allows wearers to customize their hearing assistance to their individual needs and lifestyle. The design is pretty cool, being almost invisible when correctly placed inside the ear, and held comfortably, and securely by their patented Flexi Palms, which are soft, silicone feathery bits that lightly hug the ear canal. They allow air flow into the ear, as well as some traction so your device doesn’t fall out during physical activity. A full charge will last up to 16 hours, and the Neo‘s carrying case holds another 7 days worth of power, so you’ll be able to juice up your hearing aids while out and about, even on long trips. The app gives you access to hearing professionals, who can send you updated sound settings, but you can also use it to personally adjust your devices in the moment. Eargo Neo will be available at the end of January, but you can go ahead and check out their current hearing aid products at www.shop.eargo.com. I brought a couple of these featured products home with me to review, and I hope to get all of them into the office before long, as well as many others from ShowStoppers, as they become available for retail release. If any of these sounded interesting to you, or if you’d like to be surprised by other products not listed in this limited list, please check back on our site for more in-depth coverage in the near future. My 3rd and final CES wrap-up article, on some of the awesome products I discovered on the Convention Center and Expo Center Show Floors, will be out soon, so come back and check that out too.